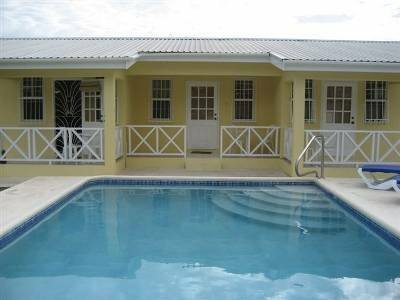 Well presented, tastefully furnished two bedroom villa set in a tranquil location. Amenities include a fully fitted kitchen with the full range of cooking utensils; an open plan living area with ceiling fan; two bedrooms with fully fitted wardrobes and air-conditioning, one bed room contains a double bed and the other 2 single beds which can be arranged as one queen size bed and a bathroom with toilet and walk in shower. The villa also boasts a private veranda with outside seating; cable TV and CD/DVD/home cinema system, wireless internet and phone. A mobile wireless internet dongle for those requiring internet on the go can be rented and topped up locally as required. There is also a shared laundry room, with washing machine that is available for guests' use free of charge as well as free twice weekly cleaning services that include a thorough clean of the villa and bed linen and bath towel changes. The villa is one of three and shares a spacious garden, swimming pool with loungers, large gazebo with outdoor dining sets. All the family can enjoy the outdoor facilities at Affinity, take a swim or relax by the pool; play in the garden or simply take the heat off in the shade of our large gazebo that can also be used as an outside dining area. The villa in the ideal location to experience the tranquility of Caribbean living whilst being able to easily access the whole island by car or bus. It is accessible by car or bus from the airport, the journey takes less than 15 minutes. The tranquil location is 3 minutes’ walk to the main road which is a busy bus route taking you across the island and the property is within 5 minutes of a quiet beach. There are several local services within 5 minutes walking distance of the property including an English pub, doctor's office with pharmacy, bars, restaurants and a min-mart. A further distance away though within walking distance are the busier areas of Oistins and St Lawrence gap with supermarket, bustling night life, multiple restaurants, banks and beaches. Smoking is no longer permissible in indoor public spaces in Barbados. Please smoke on the veranda, gazebo or garden. The property boasts an outdoor gazebo with outdoor dining facilities for communal use and a basketball net for kids and adults!